Bashar: As we have said recently, and for many years of your time, you will find that as you change your collective consciousness about what kind of world you prefer to create, you will need to create new systems to replace the old systems when they begin to crumble and fall away. They have now begun to crumble and fall away. So the idea is to not think about how to change the older systems, because the older systems will not be applicable in a new reality, but to create new systems that are befitting the new reality that will replace the old systems when they finally collapse under their own weight. Do you follow me? Bashar: Does that address your question sufficiently, or did you want to take this in another direction? Q: Well does this also apply to our political system as well? Bashar: It does, eventually. It applies to every single social (institution or) system on your planet within the next three decades. Q: Okay. Yes. And so you’re saying this is an exciting transformation? Bashar: There always is. Remember, every situation is fundamentally neutral. There is no built-in meaning to anything. Life is fundamentally meaningless. I mean that in the most positive way possible. (Audience laughter) By being fundamentally meaningless it means you can put the meaning to it that you prefer. The meaning you put to it determines the effect you get out, because it can always do double duty. If you put negative meaning into a situation, you will get a negative effect. It’s a fact. Put a positive meaning into a situation, you will get a positive effect, regardless of what other people get, based on what they put in. So the idea is you have an opportunity with whatever is happening in your reality to decide whether it is a negative or a positive experience for you. Even if you don’t intellectually understand exactly how it might be so, the idea is to, again, trust the higher mind that if you are experiencing this it is an opportunity for you to use it in a positive way. You can decide to do so. And when you decide to do so, that’s what you will get. Again, regardless of what other people all around you may be getting. It really does work that way. I know, I know, I know, from having dealt with many humans over many years, that some of these ideas may sound to you, to your language, to your culture, to your society, like what you call euphemistically “pie in the sky”, but this is simple physics. This is how it works. And we understand that one of the reasons many humans have a great deal of difficulty understanding some of these principles is because they’re actually so simple– because you’ve been taught to believe for generations that if something is that simple it just can’t be true, that it has to be difficult in order to be worth something, that it has to be complicated in order to mean something, in order to be real. But the fundamental nature of existence is actually quite simple. And one of the great simplistic structures within creation is the idea that nothing has built-in meaning, it’s just a neutral prop, it’s just a mirror reflection, there’s no substance to it until you decide to put some substance in it. That’s what it means to be made in the image of Creation and be a co-creator. It’s not so much the idea of manifestation that you’re creating, t’s the idea of what meaning you give to the manifestation. Please understand something very important. We have talked for a long time, in your terms of time, about the idea of manifestation. You must understand that the idea of the creation of an event is actually a two-part process. It’s not just the thing itself. Your reaction and your response to it is the other half of the event, and without a reaction, without a response, there actually is no event, at all. So when something occurs, a situation, a circumstance, it’s actually not a complete event yet. Your reaction negatively, your response to it positively is what actually gives it substance and creates an actual event. So it’s a two part process, without which there is no event, at all. Make sense? Bashar: Does that help you? Bashar: Does that address the situation you brought up? Bashar: Well Thank you very much. Bescheidenheit ist keine Tugend. Sie ist ein Laster, eine Last, unwürdig für ein göttliches Wesen! Kein Wunder, dass Bescheidenheit vor allem von jenen Instanzen gepredigt wird, die selber alles andere als bescheiden sind, so wie Kirchen, Regierungen, Königshäuser, die alle dem “Volk” vermitteln wollen, es solle sich doch bescheiden und das “Schicksal” akzeptieren. Unter Schicksal versteht man dann Jobs als Zeitarbeiter, unterbezahlte Hilfsarbeiter oder gleich Arbeitslose, denen man dann ein bescheidenes Almosen zukommen lässt. Die Bescheidenheit geht Hand in Hand mit einem mangelnden Selbstwertgefühl, das, wie ich schon öfters geschrieben habe, die Volkskrankheit Nr. 1 ist. Deshalb ist das erste Gebot, wenn man einmal festgestellt hat, WAS man will, seinen eigenen unermesslichen Wert zu entdecken und zu akzeptieren. Und dann kann man beginnen, zuzulassen, Was man will und man muss sich nicht mehr von den wasserpredigenden, weinsaufenden “Autoritäten” ins Bockshorn jagen lassen. Bashar speaks about the underlying structure of the physical world that is called by many names, like Merkabah, the philosopher’s stone, the tree of life or Kabbalah. 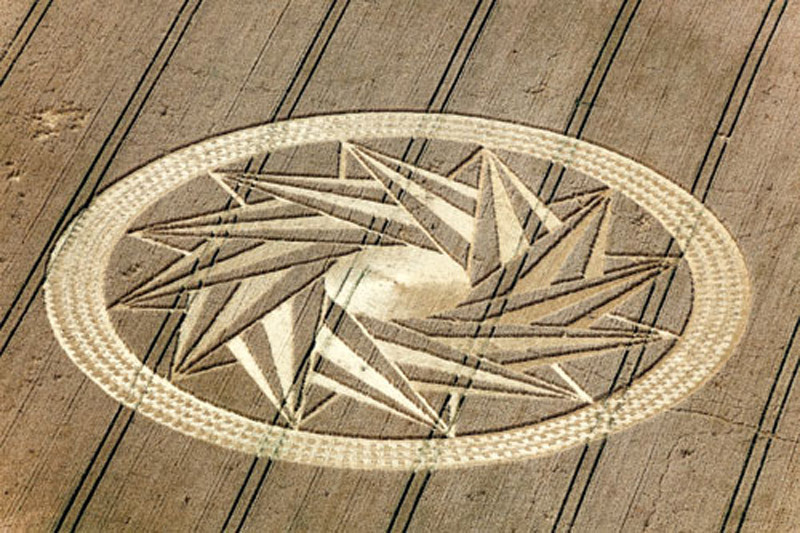 He says also that crop circles are a shadow of this one example of shadows of slices of this underlying template. If one can learn to vibrate in accordance to the frequency of this inner template, then one can really utilize this energy. This is the key! We would like to entitle this short idea “The Bones Of God”. Allow us to address the concept that in what you call nature there are obviously certain principles that you observe and that can be rendered, shall we say, down in their most basic form to mathematical equations, mathematical proportions, ratios and relationships of one, or many things to another, one or many things, all of these things you may call laws of creation, laws of nature, forces of nature and so forth are, when viewed on a very basic level, simply really nothing more than relationships of one thing to another, or one group of things to another, or one group of things to another group of things, or any combination you wish to label it as being in that same manner. This relationship, this mathematical proportional relationship, is a description of the template so to speak that underlies all that you understand physiological reality to be, is kind of web a kind of tapestry made out of conceptual threads that when interacting with itself, forms a geometric pattern and a variety of geometric shapes, concepts and experiences.This template can in some senses be called the bones of god since it is the underlying structure, this geometric pattern, this concept, this idea relationship, is the underlying concept upon which all physical experiences hang, in which all physiological experiences occur. It is the setting. It is the stage. It is the very fabric out of which any experience in physical reality is made, is built upon. It is substance and form. It is shadow and light. It is everything you perceive the physical universe to be. When you get a handle, as you say, when you can focus down into that level, this template level, the skeletal level of physical existence, you can then utilize this perception of this template, this primary fundamental framework, as a key to unlock the idea of what physical reality is capable of being, of what you are capable of experiencing.This key has gone by many names in your society, in your history. It is called the philosopher’s stone. 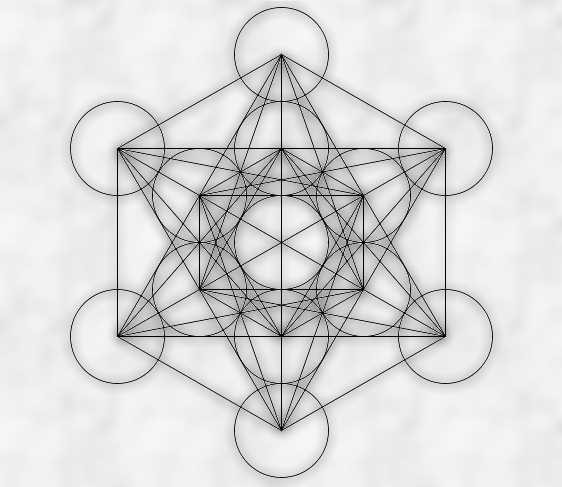 It is called the Merkabah. It is called the tree of life. It is called the Kabbalah. It is called many things, but it is all the same one idea. In many of what you call now upon your planet the appearance of the crop circles, the appearance of different kinds of geometric formations, in the fields of grain that grow upon your planet you are seeing one example of shadows of slices of this template, this underlying template, the bones of god, if you will, the bones of creation.And when you can learn to really vibrate in accordance to the frequency of this inner template, to match its vibrational frequency, then you can really utilize this energy, utilize this key, as we have said, to truly unlock reality in a new and profound way that allows space & time to become very, very, very nebulous, very malleable, very plastic, can be re-arranged by what you might call intention and mental energy much more easily when you utilize this core key vibration.Getting in touch with this core key vibration. being able to perceive the skeletal framework of existence, the bones of god, simply involves deeper appreciation, deeper attention to these proportions ratios and relationships mathematical constructs that exist throughout nature that again have gone by many names. But in your own unique way, each of you, as an individual, can approach this idea and have your own unique relationship to this idea, and interpret this idea, in any way, shape or form that suits you best. You can interpret it through vibration in song, through visual vibration, artistically through words, through actions, through construction architecturally. Any number of ways can capture the resonance of this underlying template. And when it is so captured, or represented, or symbolized, or manifested, it thus does vibrate in harmony with this core template by whatever form you choose to represent it, by whatever symbol you use.And in vibrating in harmonic resonance with this core template, this skeleton of creation, all who then become exposed to that manifestational piece, no matter in what way, they are exposed to it, no matter what senses are used to perceive it. 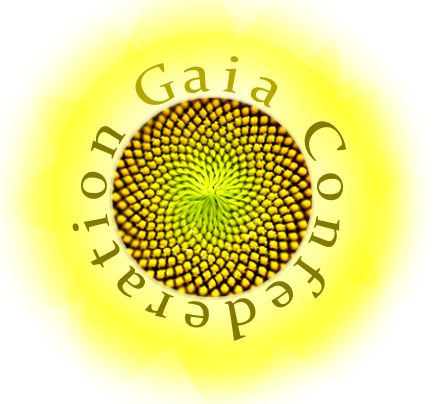 They then can take upon themselves that core resonance, and allow that core resonance, to unfold within their imagination, within their mind’s eye, within their intuition, in such a manner, as to allow them to find through their own inspiration what method of expression would best suit that individual in order to unfold their particular manifestation of this underlying structural template of the bones of god. So explore this concept whole-heartedly. There are any number of different ways to do so as we have said. Whatever resonates within you the strongest, be it any form of art, any form of creative expression whatsoever, and sometimes even what you would call logical construct.Allow yourself to feel and appreciate the beauty of this beautiful relationship concept that exists throughout all of physiological reality that underlies every experience, every object, every person, place and thing, every dimension. Every concept that you can possibly have within the idea of your universal reality it is all tied to this one template, the bone, the skeleton of the infinite, in that sense. And in a very real way, thus, you can understand that this framework, this tree of life, this Kabbalah, this Merkabah, this form, this geometric pattern is therefore the most basic manifested representation in physical reality of the infinite. It is the seed itself that blossoms into every other thing that exists in your universal reality. So trace it all back. See the commonality. See the connectedness in the templates, in the patterns of all things, and you will see like an x-ray, with your senses, the skeletal framework of all that is.We thank you for allowing to reflect this notion from this particular point of view this day of your time. A questionner asks Bashar about how to change the government of the United States. The answer of Bashar is to change oneself and act as wanted and not re-act to the manifested. Of course this advice is valuable for all nations. Ende des letzten Jahrhunderts schien der Feminismus keine große Rolle mehr zu spielen. Die legale Gleichberechtigung war schon seit geraumer Zeit erreicht und es gab keinen Grund mehr, Frauen weiterhin als Opfer der Männer zu begreifen. Das hat sich im Zuge der Neuen Weltordnung zu Beginn des jetzigen Jahrhunderts schlagartig verändert. Frauen sind wieder die Opfer und müssen über das Gender Mainstreaming gleichgestellt werden. “Gender-Mainstreaming unterscheidet sich von expliziter Frauenpolitik dadurch, dass beide Geschlechter gleichermaßen in die Konzeptgestaltung einbezogen werden sollen.” Wikipedia Da fragt man sich natürlich, wer gestaltet das “Konzept”? Offiziell sollen “beide Geschlechter” berücksichtigt werden, aber es wird schnell klar, dass Frauen bevorzugt berücksichtigt werden sollen und dass Gender Mainstreaming eine Fortführung des Feminismus unter anderer Flagge ist. “Die Zugehörigkeit zum weiblichen oder männlichen Geschlecht ist noch immer eine der prägendsten und bedeutsamsten gesellschaftlichen Unterscheidungen” schreibt das Bundesministerium für Familie, Senioren, Frauen und Jugend. “Familie, Senioren, Frauen und Jugend”? Ist das Bundesministerium für Männer nicht zuständig? Haben die im Bundesministerium keinen Platz oder sind sie gar die Initiatoren des “Konzepts”? Weiterhin gibt es bei diesem Bundesministerium für spezielle Gruppen eine Aufstellung über den Unterschied zwischen Gender Mainstreaming und Frauenpolitik: “Gender Mainstreaming führt jedoch dann zu gezielter Frauen- oder Männerförderungspolitik, wenn sich aus der Analyse ergibt, dass vor allem geschlechtsspezifische Benachteiligungen zu Lasten eines Geschlechts abzubauen sind.” Da das Bundesministerium für Männer nicht zuständig ist, kann es sich nur um Benachteiligungen bei Frauen handeln. 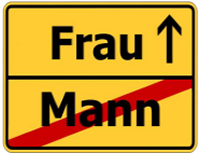 Nebenbei bemerkt… Was die “Senioren” betrifft, so müsste man ihnen – Männern wie Frauen – nur ihre selbstverdiente Rente im vollen Umfang auszahlen, um sie “gleich zu stellen”. Das Bundesministerium führt weiter aus: Der Gender-Mainstreaming-Prozess macht institutionelle Frauenpolitik keinesfalls überflüssig, da die vorliegenden Analysen gezeigt haben, dass Frauen in weiten Bereichen noch benachteiligt sind. Das Instrument der Frauenförderung wird daher noch lange angewandt werden müssen! 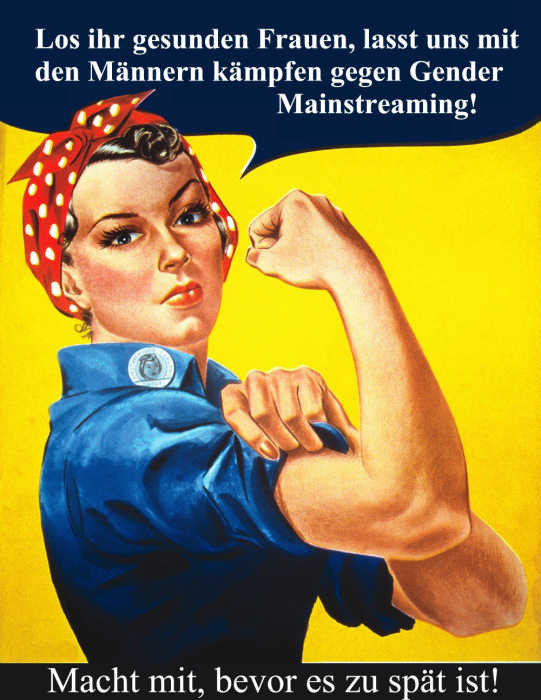 Neu ist, dass der Gender-Mainstreaming-Ansatz auch die Situation der Männer in unserer Gesellschaft mit in die Analyse einbezieht. Ja ja, blablabla, und so weiter. Viele Worte um einen Kontrollmechanismus für beide Geschlechter zu installieren, der über die Schiene des Feminismus läuft und nur mit anderen Begriffen bezeichnet wird. Es werden viele Worte gebraucht, um Gender Mainstreaming populär zu machen. In Wirklichkeit dient die angebliche Benachteiligung der Frauen nur dazu, die Männer ebenfalls zu „Opfern“ zu machen – flächendeckend. Und was kann man besser manipulieren als Opfer!